The true role of the Aztec warriors priests in the military is a tough topic to cover. Little is actually known about their behaviour on the battlefield, but we know they were tooled like traditional warriors, carrying weapons and armour suitable for combat. It’s possible and highly likely that they were focused on the capture of enemies, keeping them alive so as to use them as human sacrifices later. An Aztec warrior priest of the Cicitlallo Cuextecatl ranking. The Aztec warriors priests were dressed in a similar fashion to regular warriors, and even had the various stages of rank and order. At the lowest rank a warrior priest would wear a simple ichcahuipilli, but later as he moved through the ranks he would earn a war suit known as a tlahuiztli, which would change colours as he progressed. 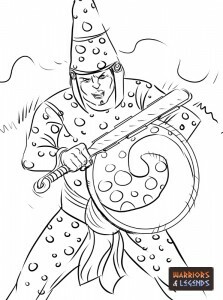 It was common for a warrior priest to wield a macuahuitl and a shield to attack and defend himself. The Aztec warriors priests had a ranking system almost identicle to the traditional warriors progression system. Based on the amount of captives and bravery in battle, the warrior priests could rise in rank and status among their order. The Codex Mendoza depicts the six primary rankings of the Aztec warrior priests in detail from their weapons and clothing to their armour and shields. Each rank had its own unique style, allowing them to be easily recognized in battle. Unlike the warrior ranks however the warriors priests were not always assigned a unique name, for this reason we have simply named them where needed based on their captive count. The lowest rank of warrior priest wore a simple ichcahuipilli, and a plain shield and a macuahuitl. Just like a similarly ranked warrior, this level of priest would not wear sandals yet. Now with two captives the warrior priest is adorned with a tlahuiztli, a war suit in all white, and in addition to his macuahuitl, his shield is now decorated with a yellow background and white spots. At this rank the priest also bears a back banner known as a pamitl in classic nahuatl, which features a blue red and white circular decoration on the back and a rising banner with decorative cotton balls adorning it. Additionally this level of priest has still not earned the right to wear footwear yet. With three captives the priest now earns sandals for his feet, and a much more colourful appearance. The war suit is now a deep green colour and his shield is a piano key design with red, yellow, blue and green keys, and the shield is now tailed with decorative leather strips on the bottom. The pamitl is now a more traditional style, with a red pole and a green feathered top. A priest who had taken four captives wore a tlahuiztli known as the Cicitlallo Cuextecatl, which roughly translates as starry night. This unique war suit really made this warrior priest stand out, and it was paired with a conical hat with the same decoration as the suit. Interestingly this level of priest has no back banner. A priest who had taken five captives was the bearer of a blood red tlahuiztli. For armour his white and red shield with the graphic of an eagle claw painted on the face was also adorned with leather tailings. His back banner was elaborate and featured red banner poles with a circular red top with bright red feathers flaring off almost like a burning sun. A priest who had taken six or more captives was now the owners of a fearsome coyote suit. This warrior priest wore an all yellow tlahuiztli paired with a yellow wooden coyote helmet which is adorned with green feathers tailing off. The Coyote warrior priest was by far the most intimidating of these priests with his fearsome helmet and did not wear a back banner. Not only were the priests important in everyday Aztec society, government, document and religious ceremonies were key tasks, they were also important in battle. The Aztec warrior priests would make their presence known on the battlefield, swinging their macuahuitls at their foes, hoping to capture some more potential sacrifices.